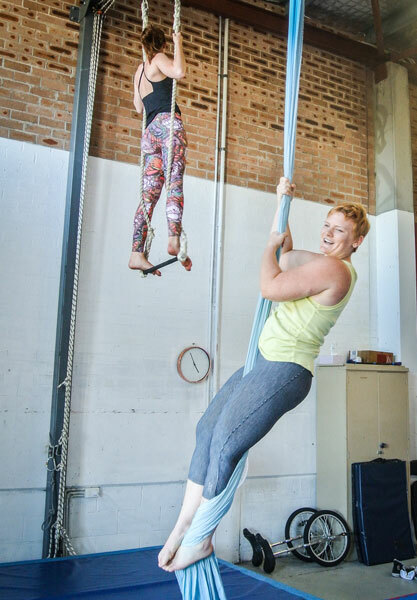 Circus isn’t something you come across everyday, so unless you’ve been to other studios or have friends already taking circus classes, chances are this is all going to be a bit unfamiliar. That’s why we’ve written this FAQ guide answering a few of the more common questions we hear. Do I have to be fit/strong/flexible etc? First tricks on aerial silks! This, or a variation of it, is probably the most common question we hear. The answer is a resounding nope! Circus is accessible to everyone, your trainer will build on the skills you have and break skills down into achievable progressions so you can work at your own pace. As long as you’re signed up for the right level class, you’ll find everyone else in your class is in the same boat (we recommend you start with a beginner class unless you’ve had previous experience). You’ll be in a small class, with one instructor for every 6-8 students. That gives you a chance to learn everyone’s names and feel supported by your classmates as you learn together. All gear is provided for the classes, so the main thing to bring is yourself! You’ll also want a bottle of water, and comfortable clothing suited to what you’ll be doing. Have a look at our blog post on what to bring for detailed information on each class. All our classes start with a warm up suited to the students, whether that be silly coordination games for the younger students, or an active warm up for older students before more demanding skills. Some classes will have additional apparatus specific conditioning for strength and flexibility. After the initial warm up, you’ll learn a handful of new tricks each lesson, with your trainer demonstrating and deconstructing each new trick, then spotting as needed when you attempt it. You’ll often get to put together what you’ve learned into a sequence at the end of class, followed by a guided cool down at the end to stretch out tired muscles. Adult classes run on a casual basis to fit around your busy lifestyle, so you can book a casual class, or sign up for a bunch at once! If you can’t make a class one week, just don’t sign up for it, or if you realise you need to rearrange you can cancel your booking up to 24hrs before the class to have it credited back to your account, ready to use for next time. The easiest way to sign up for classes is from the timetable. Simply select Sign Up next to your preferred class time, and create an account to enrol in a class! If this will be your first visit to Circus Akimbo you can pick up a $10 trial pass for your first visit. Kids classes run by the school term, so you can sign up at the start of the term or contact us if you’d like to begin halfway through. Most of our adult classes are casual, so you can book classes as you go or get a 10 class pass valid for 12 months to book into your classes each week. The class will go ahead if there are at least two students booked in 24hrs before the start time.